This year Ryan surprised me with a night's stay at The W Hotel in Downtown San Diego. With the baby due in 2 weeks he decided that staying close to home would best. I was so glad we got to stay here, it was so pretty and so much fun to explore downtown San Diego on foot. Loved the exterior of this place and the interior did not disappoint. Especially the BED-and in my pregnant state this was exactly what I needed and what defines a good hotel. For dinner we went to Fleming's in the Gaslamp district which we were able to walk to. Something about walking around a city that I just love. No stress to park and so nice to have a minute to walk off a huge dinner. Such amazing food and the chocolate cake was to die for. Conversation and company wasn't half bad either. I am so lucky to have this guy. The next morning we took our time and had a late breakfast at The Cheese Shop. Then we spent the entire afternoon walking around the city shopping and enjoying the great San Diego weather. It was so nice to have a whole day without Camryn. And we weren't feeling bad for her since she was having a great time with Grandma & Grandpa Smart. They took the train downtown to meet us and this was her running toward Ryan and I after not seeing us for a day. Pure excitement! There is nothing better than seeing that face! They had so much fun riding the train down together. Then it was off to Rockin' Baja for dinner together before the big show...Mary Poppins! Camryn has been obsessed with the movie and songs for the past 6 months and it just so happened that they were showing it downtown at the perfect time. Grandma was so sweet to get us all tickets. Camryn was in heaven and pointed out who everyone was and sang along to her favorite songs. It was so fun to see the show through her eyes. It was just as fun to watch her expressions has it was to watch the actual show. It was such a great way to end a fabulous weekend! I am really soaking up every last minute with Ryan and my little family of 3. I'm so glad that the baby cooperated and allowed you to have this time away together. Camryn's expressions are the best! Hopefully she won't be too sad when you are gone to the hospital-you look great for a mama ready to deliver! aw i am so excited to see this baby! hope you are feeling good. looks like such a fun anniversary. well done ryan. and well done erica for being such a babe at 38 weeks pregnant. Happy Anniversary you two! Darling couple! I can't believe your 38 weeks, your so tiny!! You look beautiful! 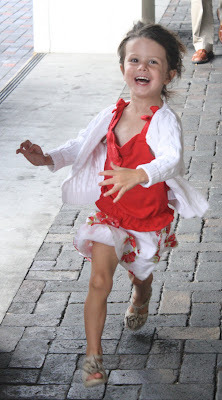 Camryn is so dang cute, I love that picture of her running to you guys. So cute! Loving it all!! Oh how blessed your family is:) Anxiously awaiting arrival of baby #2, but probably not as much as you. Been thinking about you!